Parklands is committed to maximising the ecological values and functions of our beautiful site. We do this by creating habitat connectivity, removing weeds and increasing native vegetation and tree cover. In addition to the Habitat Restoration Program Parklands has created a number of artificial tree hollows (nest boxes). Parklands conduct a comprehensive fauna monitoring program, consisting of three ecologists who scientifically monitor the comings and goings of any bats, birds or small mammals on the site for statistical assessment. This monitoring takes place one month before, during and one month after each event and helps determine any impact the festivals might be having on the surrounding environment. More than 200 days of on ground assessment has occurred to date. This venue is one of the most closely studied plots of land in the Byron Shire, if not the Northern Rivers. 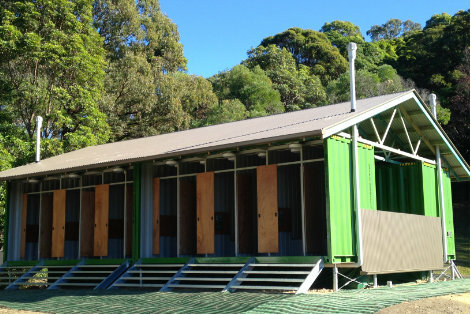 Thanks to Byron Shire Council's commitment to sustainable technologies, council granted Parklands an approval for 246 composting toilets in 2013. Parklands worked with the Australian company Quicksmart Homes who designed and commissioned the 246 bespoke composting toilets and 192 low-flow gas-fired shower stalls. Parklands now has an incredible 246 waterless units, which significantly add to patron comfort and amenity. Being 100% re-locatable this design allows a huge amount of flexibility in terms of providing unique camping and event lay-outs for events held at Parklands. It also supports Parkland's environmental philosophy to manage water cycles (water and waste water) sustainably. This initiative provides a number of key environmental benefits including a significant reduction in waste-water truck movements and a dramatic reduction in waste being sent to the Byron Shire Council owned sewerage treatment plant (STP). Complementing this initiative Byron Shire Council provided an approval to augment our existing grey water treatment facility (which processes shower water). This facility can now treat up to 920,000 litres of grey water on site, further reducing the amount of waste water directed to Byron Shire Council's STP.